Back in the day, bands and musicians gauge their success status and influence by having a themed pinball designed after their craft. It is like having a film or a TV series dedicated to them. To this day, only legendary bands and singers have this kind of accolade under their belt. And rock bands are not short of the privilege of having their names on a Pinball machine. Sure you have in mind your favorite rock band. But have they been featured in a pinball table? 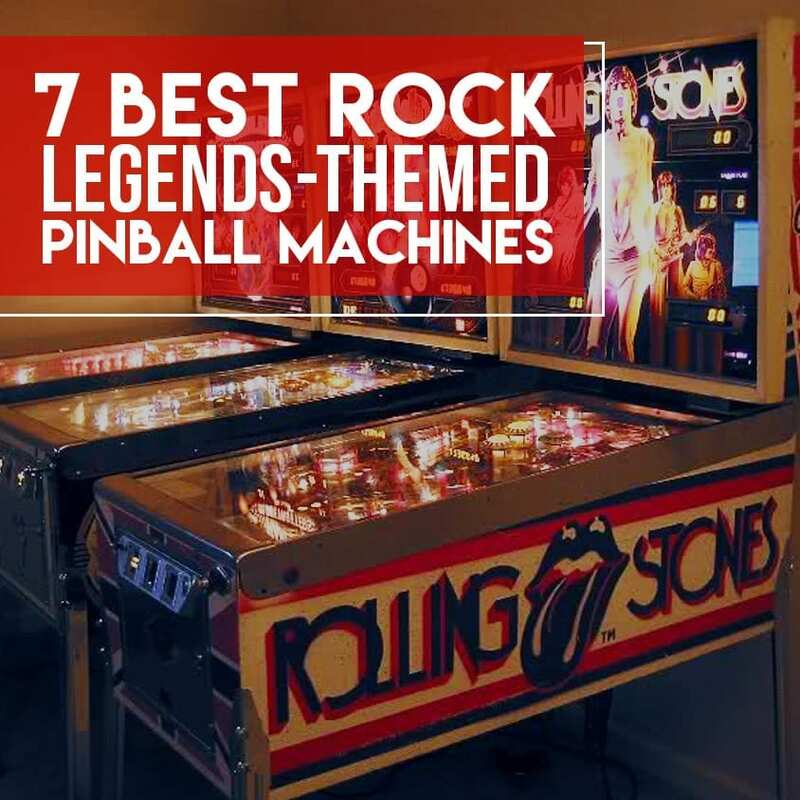 In this list we give you 7 of the legendary rock bands that have been featured in a Pinball machine. AC/DC Pinball Machine has got all the features that both fans and pinball players surely love. It features 12 of the band’s most successful hits including “Highway to Hell, “Back in Black” and “You Shook Me all Night Long”. First launched in 2012, the AC/DC got their first pinball machine during the resurgence of pinball mania. And in 5 years, it’s manufacturer–Stern Pinball– announced the comeback of the machine to the market, thanks to the ever growing demand for the arcade game. The Rolling Stones is one of the few musicians who has got the prestige of earning two Pinball machines to their name. They’ve been featured in the 1980 Bally pinball and the the 2011 machine by one of the remaining few pinball manufacturers in the world, Stern Pinball. As most players and fans would profess, the former is way superior both in artwork and the gameplay design. The 1980’s version of the machine features Rolling Stones’ hit singles, Satisfaction, Jumpin’ Jack Flash, Miss You and When the Whip Comes Down. The Who’s 1969 album, Tommy, gave them immense success as it was adapted into film and into a stage play. This same album also paved the way for two pinball machines to be created to their credit–both of which remains a favorite among pinball players. The first Tommy pinball machine was created by Bally in 1975 as part of the promotion for the film adaptation of the album. And the 1994 pinball by Data East for the promotion of the stage version of the same album. The 1994 Data East pinball of the band Guns n Roses is a gem for collectors and fans alike. It is made with great attention to detail. One thing we love about this machine is its plunger which is modeled as a revolver. And when the game starts, the band’s “Welcome to the Jungle” tune automatically plays. The machine also is unique and one of a kind for featuring an outtake from Use Your Illusion, “Ain’t Going Down” which is the only medium on which the soundtrack was officially released. It also adopted the magnet ball stoppers, a feature which the machine adopted from the best-selling Addams Family pinball. Stern has released a pinball machine designed to honor one of the legendary rock bands in music history, Metallica. The machine design including the sound effects and soundtracks included gives a complete Metallica experience to players. It features 12 biggest hits of the band including “Creeping death, Seek and destroy, Master of Puppets and The end of line. Another cool features of the table are the toys and designs on the playing field. And its inline drop targets make it a rare pinball nowadays. Perhaps the most eye-catching and astoundingly beautiful pinball table in this list is that of Kiss. From the comics-looking playfield art to the vintage illustration of Kiss’ iconic face paints, surely no one can deny that this really is an art piece for arcades and homes. This 1979 Bally’s collectible table is then recreated by Stern in 2015 with features include custom callouts of Paul Stanley and Gene Simmons’ recorded voice. And from two hit singles featured in the 1979 edition, Stern has 10 Kiss hit songs, including Shout it Out Loud, Lick it Up, Love Gun and Deuce. The newest pinball table in this list, Aerosmith is by no means a noob in providing great gameplay experience and superb artwork design, having Dirty Gillies as the game designer. True to giving a total Aerosmith concert experience to players, The table uses hi-fi 3 channel audio system that’s thrice more powerful than the audio systems of its older peers. Nine of the band’s greatest hits are featured in the table. And on top of this is the multiball mode of up to 6 silver balls simultaneously played in a single game. Do you find this article interesting? Follow our blog for more news and stories about arcade & Pinball.